Was one of The Seven Dwarves named Lumpy? The real story begins with a family history of breast cancer. Because of this history, I do regular self-exams…..probably more than the average person but I just want to be safe. I was in the shower on Wednesday morning, April 17, 2013 when I felt something out of the ordinary on my left side. I had previously found a lump in that general area a few years ago so I wasn’t really concerned. I thought it was the same area as before and wasn’t really worried. Finding the lump reminded me that I hadn’t made an appointment for my annual well-woman exam. Later on that morning I called Dr. L’s office and was actually able to get an appointment the next day. Shocker. I also called and was able to schedule my mammogram for the same day. Shocker times 2. I didn’t give the lump another thought. Thursday afternoon started with checking in at the mammo place….I know it has a fancy schmancy name but I can’t think of it at the moment. I paid my part of the mammo plus extra for the 3D (go big or go home) and was prepared to wait for a while. Amazingly enough I didn’t have to wait long and was called in for the mammogram. The technician was really nice. I smiled pretty for all the pictures. When she told me to not get dressed yet and to wait in the chairs, I knew this was my first clue that something was up. The technician came back and said they would like to do an ultrasound on my left breast so I’m off to the next exam room. 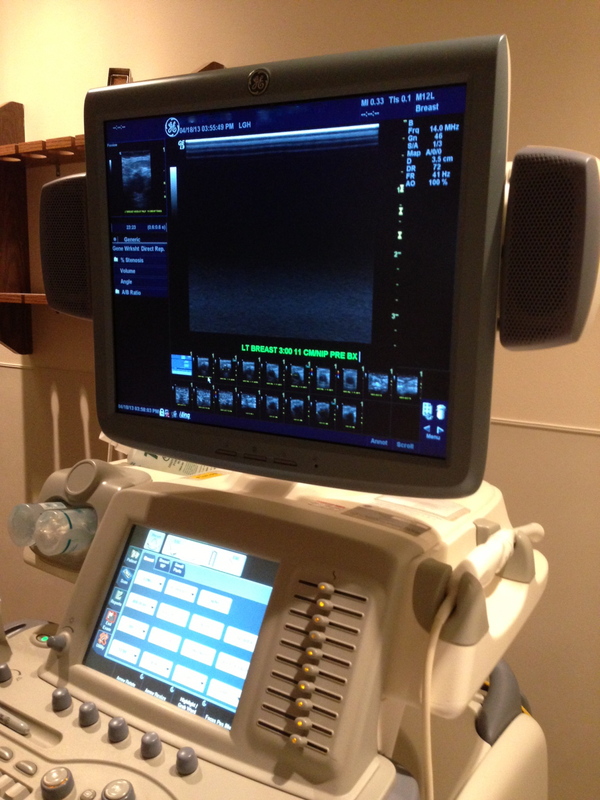 I’m lying there while the ultrasound tech was doing her thing and realize she has stopped talking. Second clue I knew something was up. I looked up to the screen and see a big, dark round blob. As the technician finished up, she said the radiologist would come in to go over the results. The radiologist came in a few minutes later and did her own examination. She said they had examined the lump and it looked “suspicious”. They wanted to do a biopsy immediately and could I stay. OF COURSE I CAN STAY!!! Suddenly the room has gotten very small. I’m in an exam room with the radiologist, two nurses, and the receptionist from the lobby. (I have to pay for more services that I don’t really want but obviously need.) At this point I don’t know if I should call Hubs or Mom because I’m far from home and it would just freak them out. So, I save the freaking out just for me. I sit and silently cry as everyone else is bustling around me. 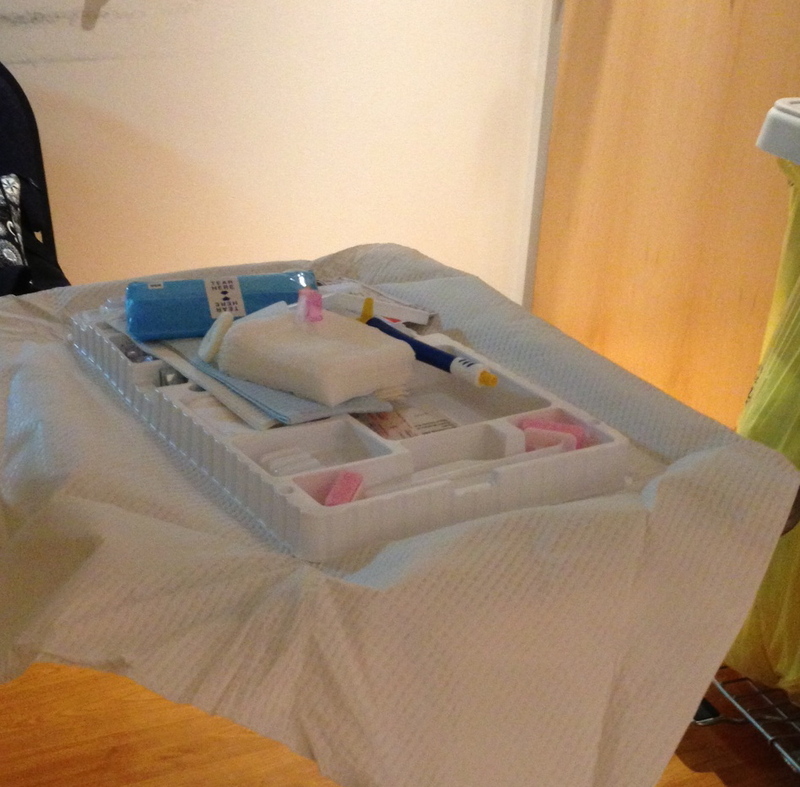 The biopsy is done. Ouch! The radiologist is totally freaking me out because she’s already talking the “C word” and treatment and I’m thinking STOP!!!! YOU DON’T EVEN HAVE RESULTS YET!! The nurses gave me an ice pack, a box of tissues, and wished me well on my drive home. The drive home seemed to take forever even though it was only about 40 minutes. I didn’t call anyone on the way home because I knew I wouldn’t be able to string enough words together to make any sense. Hubs was home when I arrived. He casually asked how things went as I walked in the door, then he saw my face. Friday comes and of course I don’t hear any results. The entire weekend is the most emotional weekend of my life. What if this? What if that? I was a crazy woman in my own head but trying to act normally for Bean. Monday comes around and I’m at work and I’m unable to concentrate. In the movies, the protagonist always gets the news in a sterile office while the doctor sits on the opposite side of a big desk. In my case, things were A LOT different. The nurse practitioner from my well-woman exam called my cell phone to tell me I had invasive ductal carcinoma of the left breast. I was sitting at my desk at work with tears streaming down my face. Ok, now I know. What’s next? Ugh this hits me right in the feels. *hugs* Love you!! What’s next? Your courageous battle, which you will win. We will hear you ROAR!! Love and hugs and kisses. I am here (remotely from CA but still around) for your journey. LOVE and Kisses MWAH. Love you, Shan! Glad you are writing your story. My heart just fell reading this.